However, that year an imposter appeared among the candidates. Can you spot who it was? The odd-woman-out, or odd-man-out as it were, was Sylvia Jones. 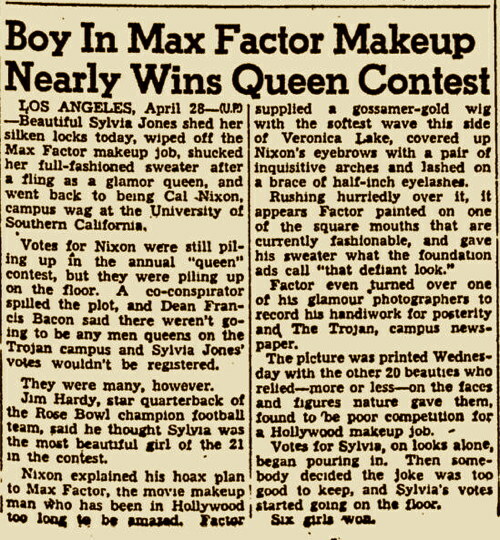 She was actually a he — Cal Nixon, a male USC student who had dressed up as a woman as a prank in order to enter the contest. 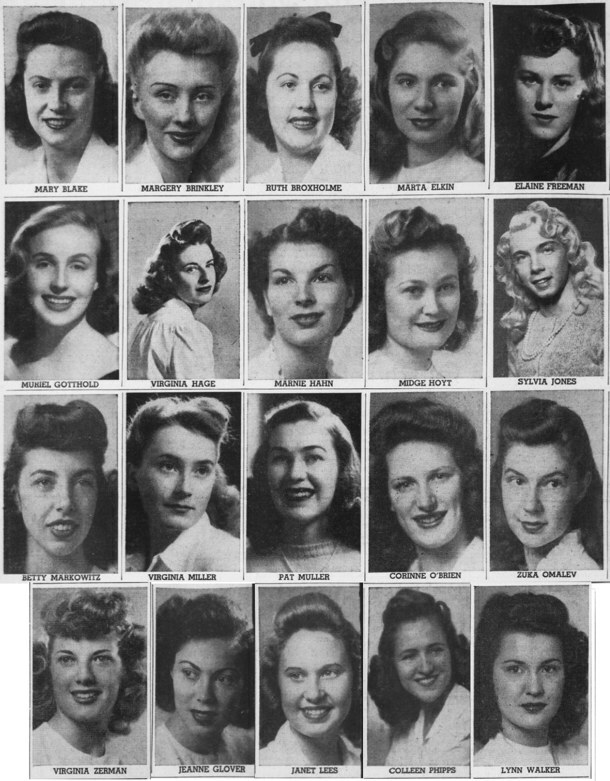 What made this slightly more than just your average campus prank was the involvement of Max Factor, the famous makeup artist for the Hollywood stars. Factor had agreed to do Nixon's make-up, decking him out in a "gossamer-gold wig" and half-inch eyelashes. He also supplied a professional glamour photographer to take the picture used for the contest. 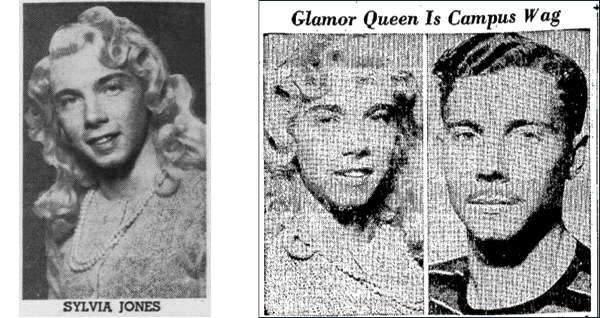 Unfortunately, Jones/Nixon never got a chance to see if he/she could win the title of Campus Queen, because a co-conspirator told the administration about the prank before the final vote could take place, and the Dean of the University, Francis Bacon, promptly declared that a male Queen wouldn't be allowed. So all the votes for Sylvia Jones were thrown out. The prank, once it was revealed, made national news, thanks to a wire story that appeared in hundreds of papers. Today what Cal Nixon did may not seem like a particularly noteworthy or shocking prank, but it was different times. Though, of course, we're still dealing with gender issues in beauty contests, such as that flap last year about whether Jenna Talackova, who was born a man but became a woman, could compete in the Miss Universe Canada pageant [Daily Mail]. Talackova looks a lot more like a woman than Jones did! For what it's worth, the final winners of the USC Campus Queens contest were Mary Blake, Jean Glover, Muriel Gotthold, Colleen Phipps, Lynn Walker, and Virginia Zerman. Well I thought you were not going to tell us who the imposter was right away but I'd already made my vote for Ms. Sylvia and then you ruined it LOL. I've seen very young men that were actually 'pretty' but typically there is a difference, probably a kind of rugged or hardness that testosterone affects in males whikle estrogen affects by softening females. As males and females grow older and those levels drop for both, males become softer while many females appear 'toughened' because testosterone levels are higher after estrogen drops away. In Jenna's case, she had been on estrogen hormone replacement for quite awhile so in fact, 'he' was no longer male, but female. No amount of makeup can remove the effects of high hormone or complete lack thereof.